The bells shaped flower of Weigela are a beautiful addition to the spring landscape. But what would you think of the idea of enjoying the blooms all summer long? Well now you can! Proven Winners® ColorChoice® Shrubs has added three wonderful colors of Weigela that bloom all summer, they are Sonic Bloom™ Pearl, Sonic Bloom™ Red, and Sonic Bloom™ Pink. The Pearl(white), red and pink blooms contrast beautifully with the bright green foliage. These new additions are easy to grow and would make a great hedge. Their reblooming qualities would give you season long color from a shrub. The Sonic Bloom™ series stand 4 to 5 foot tall and wide. Be on the lookout for butterflies enjoying a tasty treat. Much of the flower color for the holiday season comes in the form of the Poinsettia. Poinsettias now come in such a vast array of colors, it is no longer the traditional Red, White, and Pink. They have speckles, have been died, and even come in peach, burgundy, a white and pink mix and so much more. Every Christmas we like to have Poinsettias around for their color and the joy they add to the season. But this year we wanted to add a little spice to the plants that we bought ( yes bought, we do not grow Poinsettias). We found a decorative pot that we carry at Garden Crossings and added a little flare. 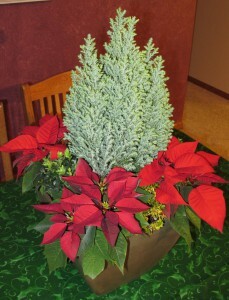 For the center piece in this combination planter we choose Amaize n’ Blue™ Chamaecyparis. Amaize n’ Blue™ is an evergreen variety that generally is planted outdoors. The soft silvery blue foliage is very ‘touchable’ as it does not poke. This is a compact evergreen growing only 1-3″, it would make a very cute border plant. In addition to the Chamaecyparis, we added 4 boxwood plants, 2 of each variety North Star™ & Wedding Ring™. North Star™ Boxwood is an evergreen shrub that has a nice mounding habit and reaches only 3″ tall, little to no pruning is needed with this variety. Also in the mix is the second Boxwood, Wedding Ring™. Wedding Ring™ has shiny green foliage with a chartreuse green edge, in the summer it turns to gold. A great variegated choice for both planters and in the landscape. Again, this Boxwood only reaches only 1-3″ tall. All the great shrubs that we used in this colorful combination A Proven Winners® ColorChoice® Evergreen Shrub. The reason I wanted to share with you my holiday combination is to just show you that sometimes when decorating( for any season) you have to think outside the box and put together some not so traditional arrangements. The first person who came over to our house and saw this said “Wow! Where did you get that? I want one!” and that my gardening friends in the comment we all want to hear when we are planting our gardens and containers! Peace, Love & Joy! Merry Christmas! Astilbe chinensis ‘Maggie Daley‘ ( False Spirea) is a long lived perennial that displays lavender pink spikes that sit high above its foliage. ‘Maggie Daley‘ blooms early to mid summer. 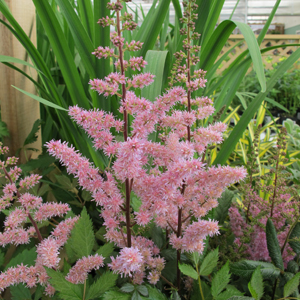 Astilbe grow is full shade to full sun, but note that a part shade location with moist soil is where they are best suited. Dryness is not in the best interest of Astilbe. With all the different Calibrachoa varieties it can be hard to know what ones to choose to make that amazing combination plant. 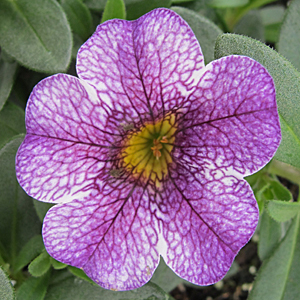 I was really struck today by the intense veining shown here in the Superbells® Trailing Lilac Mist Calibrachoa. The dark purple veins contrast nicely against the white background of this million bell. 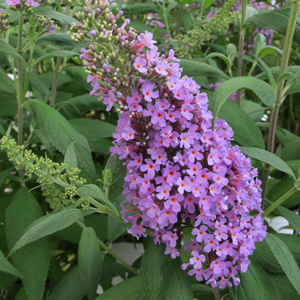 The trailing habit of ‘Trailing Lilac Mist‘ makes this a great addition to your combination baskets to spill over the sides. As the name implies, Million bells, really describes the tons of flowers that one little plant can produce. The color impact of Superbells® Trailing Lilac Mist Calibrachoa is amazing.